Hello readers – The release date for Courtlight #6, Sworn To Ascension is officially November 30, 2014! If the unscrupulous bandits don’t make short work of them, Ciardis knows that when they return she and Sebastian will have to face and unmask the man who has stolen the imperial throne. The only question that remains…will that be before or after they’re forced to battle a god? This sixth novel continues the story of Ciardis Weathervane from Sworn To Defiance. I wish I had time to post a new teaser every fifth day this release but I don’t. 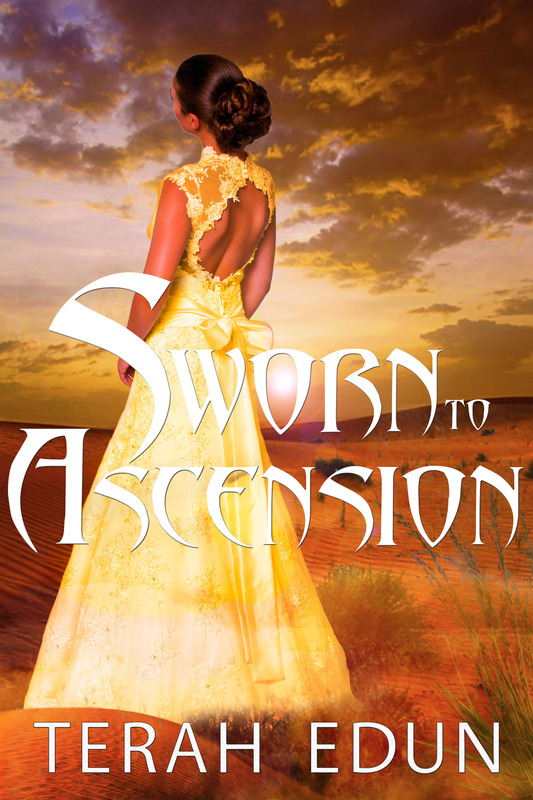 What I CAN do is post the first chapter for Sworn To Ascension this weekend on October 26th! I want your thoughts, do you like it? Does it feel like Ciardis? Most importantly, does it keep your interest? I tried something different for my last release and now I’m going back to my tried and true format. So check this page on Sunday morning for your first chapter of Sworn To Ascension! 😀 I’ll also be posting it on Facebook. It was a few hours after General Barnaren’s celebratory send-off and already the night was taking on the deep purple and dusk tones of a dawning day. It wasn’t quite the next day yet, but it was coming. Ciardis Weatherane knew that and she was dreading the moment the day truly began and she would have to get out of bed. When she had wearily tucked herself in for the night, mind whirling from the meetings they had convened and the people she had faced off against, she had been sure she was not going to like what was coming the next day. But she hadn’t imagined a night spent battling nightmares and dreams of darkness either. Now she was sitting bolt upright in her bed and a fierce dead was clawing its way up from her stomach, through her throat like a poison that was choking her from the inside-out. The sense of foreboding had been dogging her sleep, or her attempts at sleep, for most of the night. Preventing rest. Preventing peaceful dreams. What was left? Restlessness and a headache that made her want to kick something…or someone. Starting with the emperor and ending with the god of death and destruction. Sniffing and folding her arms crossly, as she fought not to rub her temple for the fortieth time, Ciardis remembered the last time she been beset by such a restless night and a painful morning. It had been when she was twelve…and desperately needed to get a tooth pulled. Then, as now, she had held out hope that a solution would appear and the throbbing pain in her side would magically disappear. Of course, it hadn’t and she’d been forced to go to the town barber, the only individual licensed to pull teeth or draw blood in twenty miles, but licensed didn’t necessarily mean they were good at it. Which was why she’d held out for so long that she’d lie awake at night from pain while tears soaked the cloth sack that served as her pillow. When she had finally gathered the nerve to go and the money to fund the trip, the pain had dissipated within days. But there was no simple solution to what pained her now. “Not yet anyway. To save the empire I need to find a lost dragon device and hope the god doesn’t come barreling through the rift between our two worlds in the meantime,” Ciardis said with a shudder as she sank back down under the covers with her nose peeking out of the bundled blankets. “Such an easy task,” she said mockingly while internally cursing the throbbing headache that wouldn’t go away. Ciardis tried to focus on her thoughts on other things. Anything to take her mind off the problems that were giving her so much pain. At least for now. So she let the blankets fall to her neck and breathed in deeply as she stared up at her canopy and remembered the eulogy in dedication to brave General Barnaren. The man who had passed on his advice to her with his last living breath. The man who had given his life to give the entire empire just a little more time before they had to face the blutgott’s wrath. Ciardis knew that as long as she was awake she would keep thinking the dark thoughts that had led to the blistering headache in the first place. Even if her sleep was disturbed by vivid dreams, it was better than lying awake with thoughts she couldn’t suppress. So she cleared her mind and pushed out anything but a blankness that held no sounds, no memories and no words. Just endless space. As she closed her eyes and fought to sink into the obliviousness of sleep, the loud sound of a smack against her window panes caught her attention. Ciardis surged up from where she had managed to curl into her pillow, with a long knife that she had quickly pulled from underneath a second pillow, and looked over at the window. Only to see a bird sliding down its surface, stunned from its head-on collision. Ciardis couldn’t help the hysterical laughter that immediately sprang forth from her mouth. Relief came over her and her headache lessened, at least for a bit. “Well, better a bird than an assassin,” she said bemused. She slid the sharp knife back into its secure hiding place and once more curled up. And she knew that entire week she’d be tossing and turning, if not outright awake, just like she had been last night. With a restlessness she couldn’t shake, she sat upright once more and pulled some pillows around to support her back. Ciardis couldn’t help but laugh at the irony. She couldn’t sleep in the empire’s most luxurious bed with silken sheets, soft-down comforters and enough pillows to build a fort. “There’s no way the road to Kifar is going to be any better,” she said while thumping her head back onto the pillow in irritation. She didn’t say she wouldn’t survive the road to Kifar, because that wasn’t true. She’d slept in the open forest of Ameles to the east and bunked in the frozen tundra of the north, she would survive a week’s trip to the west. But that didn’t mean she would have to enjoy it. For the moment though, she would enjoy the softness as she refocused her mind and her head became filled with concerns about the future, flitting through her mind so fast that she barely had time to register one before the other came to take its place. Thoughts of her upcoming journey to the west. Thoughts on what it meant to be betrothed to one man and bonded to another. Thoughts on how she had become an enemy of the man who stood to be her father-in-law. But above all, she wondered, how they were going to defeat a god of death and destruction, the blutgott, with a noble retinue more interested in self-preservation than outright battle, an oblivious population, and an emperor that would rather see them dead than assuming more power over his dominion. With a curse she scrambled to untangle herself from the luxury linens and threw some of those soft down pillows across the room in anger for good measure. With a furrowed brow, Ciardis realized that she wasn’t mad at the pillows or the linens. She was mad at the convenience. The luxury of lying in a bed that felt like a cloud, when she was surrounded by worry and couldn’t sleep because her night was racked with anxiety. She had come to the capitol to warn the imperial court, she had done so and now it felt like that for every step forward she made, it was one more step backward. To stave off an anxious mind, she put her feet to the test by getting up and pacing the room. Back and forth. From the bed to the washroom. Then from the window to the door. Anything to keep her feet moving as fast as her mind was whirling. Her pacing had taken her to one of the broad windows of her bedroom. Ciardis walked towards it and took in the few twinkling lights on the streets below, the lights of the streetlamps in the distance. She knew that the errand could possibly be the key to ending the war against the god before it began. If they had the collar of Diamis in their hands and its wearer on their side, they could close the gate of Ban before the blutgott emerged from its other realm. Or so the legend went. But that’s a big ‘if’, Ciardis thought wearily. What is? she heard Sebastian call in her mind in a sleepy tone. Ciardis didn’t stop her restless pacing as she barely paid attention to the second mind in her thoughts. Hearing Sebastian’s thoughts no longer felt stranger. She had become so accustomed to it to that it almost felt normal and when she couldn’t speak to him mind-to-mind, she felt a lack as sharp a missing limb. Or at least that’s what it had felt like to be surrounded by six of the emperor’s pet silencers in the imperial audience chamber. Ciardis? Prompted Sebastian’s bodiless voice warily. Ciardis was only half-listening to his requests for more clarification. Right now while the world felt like it was spinning out of control, she was pacing her room and chewing on her finger nails. A disgusting habit she abhorred from one time she had managed to bite nail while forgetting that her hands had been finger-deep in acidic dyes the minutes before. The revolting taste had broken her habit of nawing on her nails. Or so I thought? She explained. I not going to even pretend I understand that, Sebastian grumbled. Ciardis rolled her eyes at his invisible presence, said, You weren’t meant to. For the moment he was silent and so was she. Ciardis knew he was still awake though. She could tell because, the bond between their minds had grown stronger every day since they’d entered the hallowed halls of the Old Ones icy resting place in the north. He was two floors away from her and could still pick through her stray thoughts. Just as she tell that he was calm, if slightly anxious, Ciardis knew Sebastian could assess her emotional state as well. She was as attuned to his emotions and thoughts as he was to hers. The more strident the emotions, the louder they became. Everything, Ciardis replied in a soft whisper. Not bothering to elaborate on her thoughts, but not denying their direction either. Ciardis replied, Yes, now rest for a little longer. We need to be on the road no less than an hour after day breaks. We already told the emperor that we would be gone as soon as Barnaren’s celebration had ended. She heard Sebastian snort and roll over into his pillow as he sent one last sleepy thought into her mind, A few hours after dawn is good enough as I might remind you that we only claimed our beds three hours ago. Ciardis said nothing as she felt him loose focus and descend back into the depths of sleep. While Sebastian had slept like an angel for those few hours and Thanar had been off doing who-knows-what she had tossed and turned on her angelic sheets thinking about the emperor and the ‘implications’ of her seeleverbindung with the formerly powerless prince heir of the realm and the daemoni prince that seemingly everyone wanted dead. The emperor had made it clear that he thought well of their soulbonds as long as it stayed beneficial for him. Ciardis had no doubt that he was planning to use their union to shore up his powerbase. After all, having an heir and a princess heir-to-be with such a bond at his beck-and-call was a compelling position to be in. But Ciardis had to wonder how long that goodwill would last. The emperor had also made quite clear in their audience session that he would kill them all without blinking if they crossed him or didn’t return with the prize he sought. Ciardis felt her stomach twist in knots at the thought that the emperor’s mercurial temper would turn against them if he thought it benefited his cause. Regardless of whether they returned from Kifar with what he sought, Ciardis knew he would have more demands of them. Swallowing harshly, she pulled on some riding gloves, a cloak with a deep hood and slipped out of the door. As she walked quickly down the hallways with marble floors and fluted columns, she was careful to stay out of sight of the servants already bustling around with the day’s early morning errands. Dark thoughts clouded Ciardis’ head as she tried to get to the lower levels and out the side door. Ciardis remembered sitting up in the night with a hand to her heart, looking around at the dark corners of her room with frightened glances. She wasn’t one to be afraid of the dark, but when the man who was to be your father-in-law was as duplicitous as the emperor, she’d be a fool not to be looking into the shadows for assassins as well. In many ways, Ciardis thought to herself wryly, we were safer in the underground city. Only a few ways in-and-out and guarded by soldiers loyal to us at every entrance. Ciardis was surrounded by the pinnacle of luxury now, but it felt more like a gilded cage. One filled with strangers and enemies. One which lurked with menace even as it shone with warmth. Swallowing harshly she continued onward. One more level and I’m out of here, she thought triumphantly. When a gaggle of female servants whispering to themselves came towards her while walking side-by-side in a long row that took up the entire hallway, Ciardis cursed and ducked behind a column. She didn’t know why they had to walk abreast shoulder-to-shoulder like that but it was damned annoying for someone skulking through a palace with very few nooks and crannies to hide in. Ciardis took calm breathes as she hugged the marble column in front of her and waited for them to pass. So swiftly that she didn’t have time to react, a blade was wrapped around her throat and pressed up against her neck and another person’s hand covered her mouth. Stiffening Ciardis wanted to scream but couldn’t. She also didn’t happen to have a weapon on her either, even if she could break free from her assailant. Stupid, stupid, stupid, she cursed herself in her head. As the body of the person behind her stilled and the hand tightened on her mouth, Ciardis’s past flashed before her eyes. She wondered if the emperor really had sent an assassin. If this would be how she died. In the shadow corners of an empress’s palace, alone and perhaps…forgotten. Would the court rejoice her passing or mourn it? Hello. Sent an email review of Chapter 1. Hope you have time to read it. same question as Johnna above – still waiting Sworn to Ascension? any news on when it will be available?